Rajasthan Chief Minister Vasundhara Raje faced the rage of protesters during the public meeting in Jodhpur’s Osian on Friday after some people from the Rajput community raised slogans against her. But the police dispersed them. After that, her cavalcade was also targeted by throwing stones at the vehicles around 5 km ahead of the venue. The stone smashed the window panes of health minister Kalicharan Saraf’s car. Her road also was blocked and tyres were burnt by some of the youths who were upset with the chief minister since she did not visit their village. These protests forced Raje to cancel her night stay in Piparcity and came back to Jaipur by a special plane from Jodhpur. Raje blamed the Congress for the protest and stone pelting and expressed her determination to return to power. “This (stone pelting) has been done at the behest of a Congress leader. Let them understand that I will not be cowed down by such acts. I am ready to give my life for Rajasthan. This shows frustration of those who have not done any work for the development of the state. 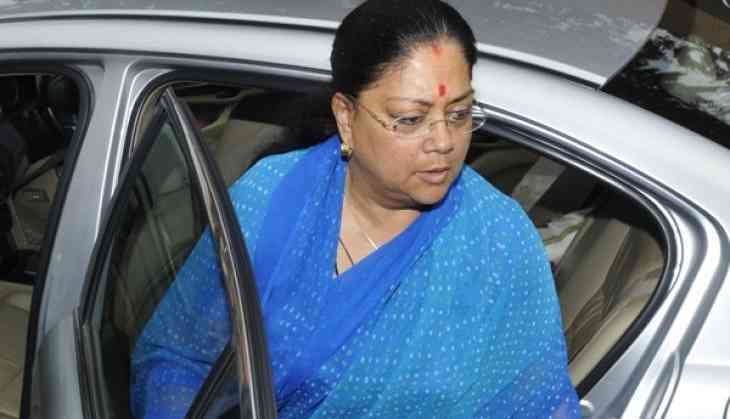 We will return to power,” Raje was quoted by the Hindustan Times as saying. Raje was addressing a crowd from the roof of the bus when stones were hurled at her by some. Police tried to nab them but they escaped. Talking about the incident, Raghavendra Suhasa, Jodhpur range deputy inspector general, said “A police videographer was present at the site and the culprits have been identified. Appropriate action will be taken soon”. READ NEXT >> India Vs England: Ahead of 4th and 5th Test match, Greg Chappell's statement about Virat Kohli will leave you in shock !